Funk DJs have been playing “Reach Down And Get It” but I wonder if even the more enlightened ones have flipped it over to find this great ballad from Rocky Mount NC Center Of My Heart. A simple opening featuring just the drums and guitar then in comes the vocalist to assert “You are the center of my heart”. It doesn’t get much more complicated after that either, as the only other instrument is a bass guitar. But as in so many other areas of life simplicity is often the best policy and the space this gives featured "Little Tim" to sing is very well rewarded by an impassioned and compelling performance. I believe this is the group’s only 45. 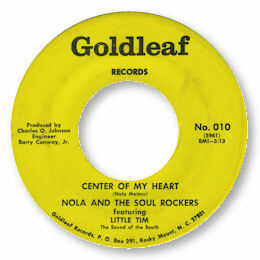 Although Fayetteville, NC's Nolla Mainor as "Nola" is the named leader of the group she doesn't actually appear on this 45, but she did manage them. UPDATE ~ My great friend Greg Burgess reports that Jason Perlmutter, the doyen of Carolina soul afficianados (see Links), has put up some more info and some great pictures of Nolla Mainor on his Carolina Soul website. You can find the actual page here. UPDATE ~ Dante Carfagna writes to say that after the Soul Rockers, bassist Nola Mainor formed the Tempos Band, who can be found backing singer Shirlean Williams on her excellent funk disc on the Elvitrue label from 1975. I'm grateful to Dante as always for his info.